firstly, huge huge sorry for not having blogged in weeks, i've just not had the time (or the weather, for that matter) to take any photos! but finally i've got something to post, hurrah. so here i am sporting what everyone takes great delight in pointing out is a pyjama top, which is totally fine by me - i love wearing pyjamas. this top is silk so as you can imagine it creases so easily and is quite a hassle to wear, but by jolly if i don't absolutely love it. oh, and these denim shorts have leather pockets. that is all. I've missed seeing your blog.. I love your top it's cute and the shorts are so cute. You beautiful lady! You look fantastic and I didn't even realise it was a pj top. Thankfully the weather will keep nice for a few weeks! Yay you're back...and with an outfit worth waiting for :) It seems to be all the rage to wear your PJs in public these days so you're right on trend. It's a gorgeous blouse though so I can completely understand why you wouldn't want to confine it to bedtime wear! Simply chic! The blouse is super pretty. I have to admit that on a few occassions I have worn tops that were suppose to be pj tops. But some pjs are too nice to be restricted to the bedroom! Love this outfit! The shorts, top and shoes go so well together. Cute outfit. 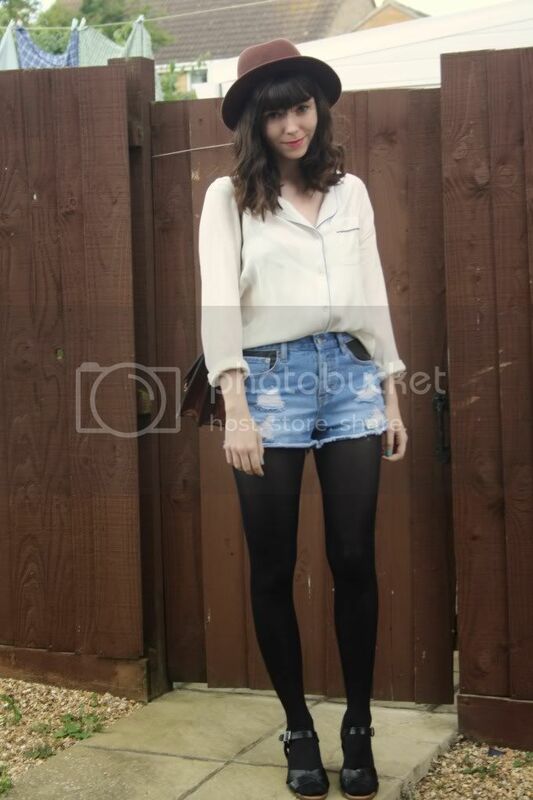 I love that Pj style blouse from Topshop. I love everything! your blog is beautiful! you look really cute in this outfit ! 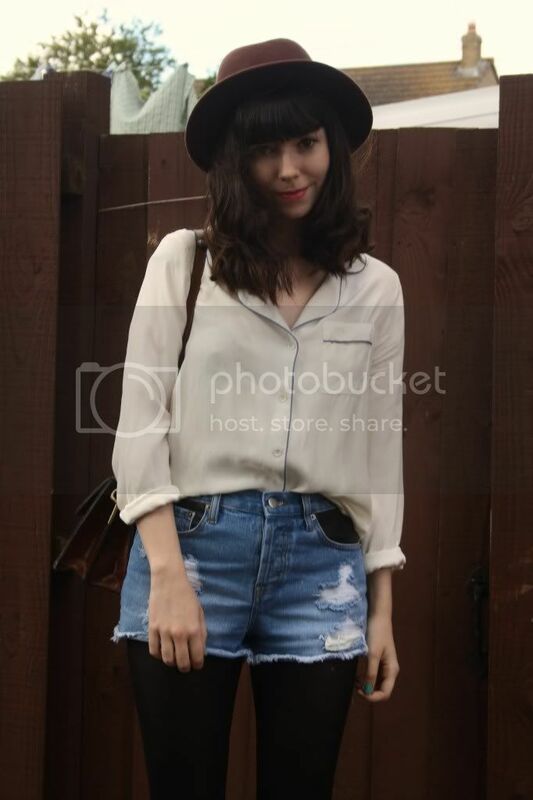 just found you and your blog on twitter ;) your hat collection is amaze! where are the best places to shop to emulate your hat style? I adore your sense of style. You always look effortlessly chic which i know all too well is extremely hard! Love your blog, i cant wait to see future posts. Love the shorts and shirt! Its difficult to know how to dress in this weather isn't it?! PJ tops are too cute. I want one. Check out my recent outfit post if you can! This outfit is so cute and chic! Loving the tights and sandals! Take a little peek at my blog if you want... I'm new you see! you have amazing style! i adore you hair! When a girl can incorporate the comfort of her pjs with the class of a street-style queen, she's got skills. Love it! Such a cute outfit. to be honest.. i do love your style.. pretty beautiful! I absolutely adore all of your looks -- love the style you bring to dressing warm -- with lots of layering, tights, sweaters, etc. Living in San Francisco it is ALWAYS cold here so I can definitely take some tips from you =) I am definitely following you now; would love it if you checked out my blog -- www.threadandbones.com so we could follow each other! This look is lovely, I love your hat!